Isaac Lally played a prominent role in schooling the last generation of the learned families of Connacht and Ulster. Of the ‘wild geese’ who departed Ireland after the Williamite wars, the Lallys of Tullinadaly, Co. Galway, stand out for the renown, both glorious and tragic, that they earned in the annals of pre-Revolutionary France. 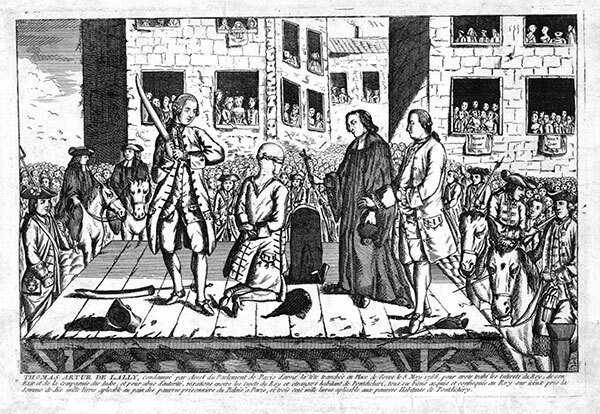 Their influence there came to an ignoble end in 1766, with the scapegoating and execution of the orator and statesman Thomas Lally. An old Gaelic family, throughout the Tudor era they performed a careful balancing act in retaining their influence—pledging loyalty to the crown and conforming to the reformed church. It was towards the end of this period that one of their previously overlooked members played a prominent role in schooling the last generation of the learned families of Connacht and Ulster, and consequently no small part in the success of the Irish Counter-reformation. While much has been written about the origins of the Lally family, there is considerable confusion in some secondary accounts, perhaps the result of later embellishment of their genealogies. According to an account drawn from the fourteenth-century-based Book of the O’Kellys, the Ua Maol Fhalaidh (O’Mullally) were a prominent family in Maonmhuíghe, a territory within the south Connacht kingdom of Ua Maine, now the barony of Loughrea. That they were a learned family is suggested by a reference in the Annals of the Four Masters recording the death of one of the name in 1487, mentioning that they were ‘head of the wisdom of Ua Maine’. It has been claimed that they were driven north by the predations of the Clanrickard Burkes and that this led to their settling in the fifteenth century at Tulach na dála (‘hill of assemblies’), outside Tuam. Primary sources suggest, however, that the Lallys’ move to Tuam took place at a later date than is often thought, as it was in 1574 that Archbishop William Lally displaced the family of the brehon Cosnamhach MacEgan, the previous proprietor of ‘Tullene Daly, barony of Dunmore’. In 1513 the Franciscan scholar Muiris Ó Fithcheallaigh unexpectedly died after his return from Italy to Galway to take up the archbishopric of Tuam. His place was filled by a Tomás Ó Maolalaidh, who was archbishop for 23 years and hosted a large provincial synod at Galway in 1523. His kinsman, William Lally, was made dean of Tuam cathedral during the tenure of Tomás’s successor, Christopher Bodkin. William allied himself to the Clanrickard Burkes and the De Birmingham barons of Athenry. In spite of the Dublin authorities’ attempts to prevent the appointment, in April 1573 he succeeded Bodkin in Tuam, and the following year he was granted Tullinadaly. He was ambitious and, with his allies, attempted to run Tuam as an independent fiefdom of sorts, the result of which was that his relations with the crown’s representatives were rarely smooth. He held the bishoprics of Tuam and Annaghdown, and acquired a warrant to add the sees of Kilmacduagh and Clonfert. In spite of his conformity to Protestantism and his collaboration with the lord deputy, Sir John Perrot, on the Composition of Connacht in 1585, his ecclesiastical plans were thwarted when Perrot had Queen Elizabeth supersede the warrant. In 1590, and for reasons unclear, his wife was ‘committed’ to the lord deputy in Galway, alongside ‘Lord Birmingham and his wife’, on the orders of the provincial president, Richard Bingham, a move which ‘frightened many’ locally. In 1594, in correspondence with Elizabeth’s secretary of state, Lord Burghley, Bingham bitterly complained that the archbishop of Tuam was ‘as bad as any of them’. 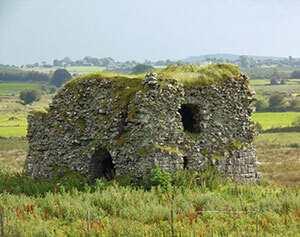 In that same year, while Lally was on his sickbed, one of the crown’s most loyal native followers, Sir Frances Shane, attacked Lally’s castle at Ahascragh in east Galway and ‘expelled the archbishop’s ward, spoiled his tenants and farmers by extortion of their goods, banished them all, and took possession of the property for his own long-term use and benefit’. Immediately upon William’s death some months later, the Trinity College fellow James Hamilton arrived in Tuam ‘to collect the temporalities of the archbishopric … granted by the Queen to the College’ by suing the episcopal tenants and distraining their cattle and horses. 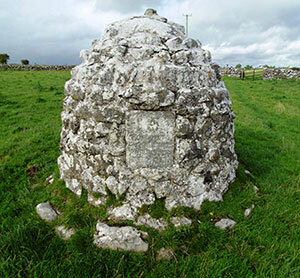 Above: The Lally memorial or leacht close to the site of the family’s residence at Tullinadaly, Co. Galway. The inscription reads: ‘IHS/pray for the soul of James Lally and his family/1673’. James was Isaac Lally’s son and heir. According to local lore, the memorial was erected on the spot where he suffered a fatal fall from a horse. After the defeat of the Jacobites, the Lallys’ lands in Galway were confiscated and a number of the family fled to France. James was the grandfather of the ill-fated Thomas Arthur Lally. If William Lally was a patriarchal ‘Abraham’ to the west of Ireland’s fledgling Church of Ireland, then his son Isaac continued the tradition and proved a pivotal figure in Connacht’s small but dynamic Gaelic Protestant community during the reign of James I. Isaac entered Trinity College, Dublin, sometime in the 1590s and was still registered as a fellow there in 1605. His teacher there was the biblical scholar and translator William Daniel. A sister of Daniel’s married William Lally’s successor in Tuam, Nehemiah Donelan, and Isaac Lally in his turn married their daughter, Marion Donelan—not, as is often stated, the daughter of Viscount Dillon of Mayo. What is known of Isaac’s career derives from the records of a 1615 regal visitation of Connacht, which was overseen by James Ussher. From these it is clear that Isaac was counted amongst the clergy of Tuam while William Daniel was archbishop (1609–28); he held the prebend to the traditional church tearmann lands at Balla, Co. Mayo, and the rectory of Ballinrobe. In 1613 he was appointed Tuam’s inaugural ‘sovereign’, when the town was chosen as one of 40 new boroughs under James I, established to ensure a Protestant majority in the parliament then meeting in Dublin. Above: The ruins of the Uí Uiginn bardic school at Kilclooney, Co. Galway. Isaac Lally’s school was in existence in Tuam by 1611, if not earlier. The visitation noted ‘[a] publique school kept at Tuame by one Lally a master of arts and a very sufficient scholar’. The authorities took issue with the non-conformity of Alexander Lynch’s much-lauded ‘classical’ school in Galway, stating that Lynch had ‘great numbers of scholars not only of that province but also out of the Pale and other parts resorting to him’. Ussher claimed that he ‘had daily proof … in that city how well his scholars profited under him’. Lynch’s refusal to conform saw him ordered to shut his school and the city was fined £400. Lally was ordered to move his school to replace Lynch’s, as ‘in regard Galway is a far more public and convenient place for the keeping of a school than Tuame is we have ordered that Mr Lally shall at Michaelmas next begin to teach publicly in that city’. Significantly, Isaac Lally did not comply. The presence of a Tuathal Ó hUiginn at Lally’s school in 1615 would suggest that his establishment may have replaced the Uí Uiginn’s bardic school at nearby Kilclooney. The same school had played an important role in the correction of Archbishop Daniel’s Irish translation of the New Testament (1602). Although the visitation records give only a glimpse, it is evident that Isaac Lally was chief educator at the time to a number of the sons of the ‘tribes’ of Galway and many of the leading families of Connacht and Ulster, both Irish and Old English. Amongst the students’ names recorded in 1615 were Birmingham, Bodkin, Bourke, D’Arcy, Hannon, Hoban, O’Kelly, Lenihan, Lynch and MacEgan. All of this must have occurred with the support of Archbishop Daniel, as the scholars’ educations were supported through the local church’s temporalities. Moreover, many of the same surnames appear amongst the lists of Tuam cathedral’s clergy and the town’s new burgesses. Of those that can be traced later, many graduated to the Irish College in Salamanca. The details, including educational background, that they gave on entry to the Continental schools is enlightening and proves that Isaac Lally’s name was no barrier to Catholic seminaries. Indeed, it seems that the Lally establishment at Tuam acted as something of a ‘finishing’ school for those young men destined for ordination to the priesthood in Europe. Fiachra Tully, who entered Salamanca in 1613, was a son of Aibhlín Ní Cheallaigh ‘of Garbally [Ballinasloe]’; his father, Thomas Tully, was of the Mac Maoltuile, the Roscommon family who were hereditary physicians to the O’Connor dynasty of Connacht. Theobaldus, son of Richard and Anaplam MacJoyn (Jennings), studied with both Lally and Alexander Lynch before entering Salamanca in 1615. A scion of two learned Ulster families, Tadhg Ó Cléirigh, a son of Seán Ó Cléirigh and Honoria Mac an Bhaird ‘of Donegal’, studied ‘in the city of Tuaim under Dr. Isac Molaly’ before leaving for Salamanca in the spring of 1622. Another graduate, Feargal Mac an Bhaird, was in Salamanca by 1615, after two years spent with Lally. He was the son of Eoghan Mac an Bhaird and Máire Ní Chléirigh, and brother of Aodh Mac an Bhaird, one of the founders of the Irish College in Leuven. Yet perhaps Isaac Lally’s most celebrated student and the one who best represents his career was John Burke. A kinsman of the earl of Clanrickard, both he and his brother Hugh attended Lally’s school. John later studied in Lisbon and Évora, Portugal, and was a noted scholar. On his return in 1624, he laboured long ‘within the Lord’s vineyard’, reconciling many to the Catholic Church. According to the contemporary Galway historian John Lynch (1599–1674), the ‘happiest bunch’ that Burke plucked soon after his return to Galway was ‘Isaac O’Molally’, who had taught ‘him and so many others at his school’ and who, through Burke’s ‘gentle argument, embraced the true faith’. Isaac Lally died in 1631. John Burke was made archbishop of Tuam in 1647. 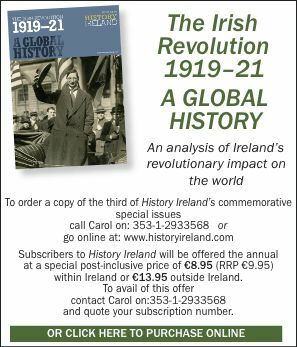 His twenty-year tenure was one of the darkest periods in Irish history. In a testament to the influence of his former tutor, Burke played no small part as mediator between supporters and opponents of the contentious mission of Cardinal Rinnuccini, and was remembered as ‘amongst the most illustrious who sat in the chair of Jarlath’. Ruairí Ó hAodha is a Galway-based librarian and historian and treasurer of the Old Tuam Society. Calendar of State Papers, Ireland. John O’Donovan (ed. ), The tribes and customs of Hy-Many (Dublin, 1843). Regal Visitation (1615), Royal Irish Academy, MS 23.F.1, 236–55. *Christopher Bodkin, the son of a former mayor of Galway, was appointed by King Henry VIII with the pope’s approval, though no official papal sanction ever reached Ireland following the king’s break with Rome. Sometime later Bodkin took the Oath of Supremacy. In his stead, Rome proposed a Raphoe native named Arthur Ó Frighil. Following his special commissary of 1565–6, during the reign of Queen Mary, the Jesuit David Woulfe recommended that Bodkin remain in situ. Having spent some time with the latter in Tuam, he believed that Bodkin had taken the oath ‘more from fear than from conviction’. ** There was no papal appointee to Tuam during the tenure of Nehemiah Donelan.